Pop. 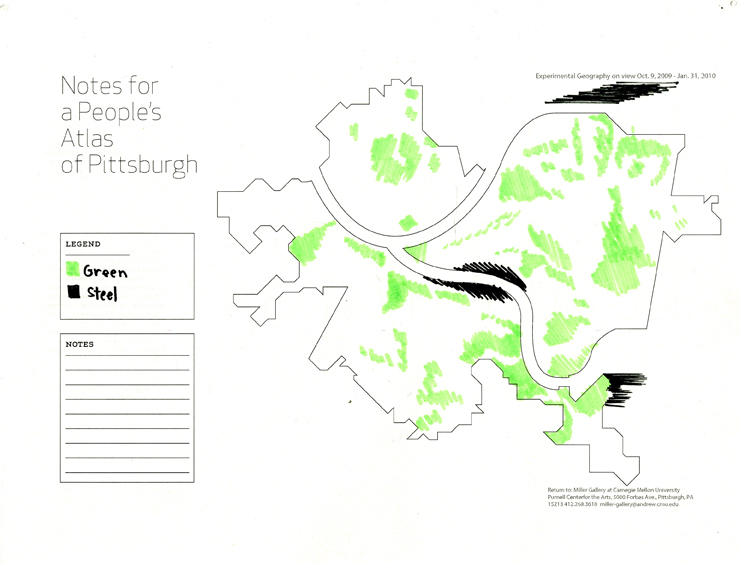 305,704Pittsburgh sits on the Ohio River Valley and north Appalachia in Pennsylvania. It is speculated to be the oldest site of human settlement in North America, as far back as 16,000 – 20,000 years. Many of its city features such as its bridges and steel manufacturing base remain from the industrial era, hence its nickname “The Steel City.” Since the downturn of steel, the city has turned to its technological, educational, cultural and financial economic sectors and labored to redevelop its old industrial sites. ● Notes: Museum staff sent a link to the downloadable blank map in emails to various people, neighbors, friends, colleagues; and included the link in various announcements, Tweets, Facebook messages. Additionally the Museum printed out maps in the gallery for people to pick up and make on site.